In its classic incarnation, a rarebit is simply cheese, melted on buttered toast, with a ladleful of mulled beer, claret or cider poured round and allowed to soak into the crumb. During wartime, rarebits were often based on a white sauce because this made the precious cheese go further. But it's not necessary these days, when you just want to cook up something simple for supper. 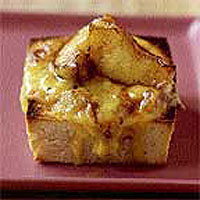 In this adaptation of the classic recipe, the cider is melted with the cheese and the bread cases stop the mix running away as it melts. Preheat the oven to 170°C, gas mark 3. Remove the crusts from the bread. Cut a square out of the centre of each slice, without going through the base, leaving a 1.5-2cm border around the edge, in effect creating a bread case. Roughly crumble the cut-out pieces with your fingers and set aside. Dot the hollowed-out bread cases with little bits of butter, place on a baking tray and bake for about 20 minutes until crisp and golden. Meanwhile, melt the cheese, cider, cream and mustard in a pan over a gentle heat. Stir until smooth then beat in the reserved breadcrumbs. Preheat the grill to high. Pour the cheese mixture into the crisp bread cases and place under the hot grill until they are golden and bubbling. You will need to serve them straight away before the bread softens. This excellent supper-time dish is delicious accompanied by buttery, fried apple slices and a dollop of honey mustard.